A hard battle was fought on the grounds of Wellmark Field last Saturday between the Iowa Barnstormers and their conference rivals, the Chicago Rush, in which the winner could not be declared until the final second. The Barnstormers came out strong throwing the first couple punches at the Rush, leading the game 21-7 at the end of the first quarter; however the relentless Rush came back on top at the end of the half, 34-27. Stormer fans were temporarily appeased at the beginning of the second half with a quick touchdown run in by Wide Receiver Jesse Schmidt. The Stormers’ and the Rush then went neck and neck for the remainder of the game until the last seconds. Up 49-47 with less than two minutes to play, the Barnstormer defense took the field. Chicago slowly inched their way to the Iowa 2 yard line where the defense held their ground, preventing another Rush touchdown. With four seconds on the clock remaining, Chicago called a timeout and re-entered the game ready to kick a field goal. And yet, between the defenses’ might and the fans’ ruckus the Chicago Rush drilled the field goal right down the center and took the victory 50-49. 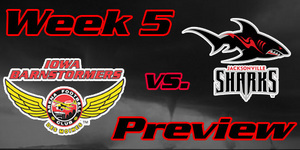 The Iowa Barnstormers (2-3) and the Tulsa Talons (1-4) will face off in Oklahoma this weekend. Another conference match up, Iowa is currently ranked third while Tulsa is sitting in last place. Although their season record may not reflect it now, the Tulsa Talons know what it takes to win as they took first place last season in the American Conference-Southwest Division, losing in the semifinal round of the playoffs to Tampa Bay. However the Talons have yet to win a home game this season so the Barnstormers will be ready for a fight in enemy territory. The Tulsa Talons (1-4) tallied their fourth loss last week against the San Jose SaberCats as they fell 42-33 in regulation play. Although ranked last in the National Conference-Central Division, the Talons fought hard and dominated the first half of the game, heading into the locker room with the lead, 24-14. However a second half slump for the Talons brought the SaberCats back and eventually allowed them to take the victory, outscoring the Talons 28-9. Iowa Barnstormers @ Tulsa Talons will be broadcast LIVE on 1700 AM The Champ, on the Internet at www.theiowabarnstormers.com and at www.nifty-tv.com. -This is the seventh meeting between the Tulsa Talons and the Iowa Barnstormers in their franchises’ history. Tulsa leads the series 4-2. Jesse Schmidt was the man with the hands last Saturday earning himself the honor of Barnstormer of the Week. Schmidt connected with Quarterback Brad Banks to score 7 touchdowns against the Chicago Rush, setting a new Barnstormer record for receiving touchdowns previously held by Mike Horacek with 6 (July 15, 2000). This mark also ranks second in League history. Additionally, Schmidt put up a total of 113 receiving yards for the Barnstormers, placing himself second in the league with 634 yards behind Utah’s Aaron Boone with 699.